Edith DEKYNDT, Dead Sea Drawing, 2010. Video. This artist has conceived works for many years, which she considers “neither spectacular, nor consumable”. She questions the relationship between the world of facts, science and experience on one hand and an eminently subjective approach to the world in what she calls a “universal search of subjectivity”. Thus the immediate perception of objects that she submits to the spectators is questioned by the paradoxical simplicity of the natural phenomena that she records. The artist then develops an implicit critique of scientific objectivity and suggests that art is a field of knowledge on its own. Edith Dekyndt looks at the waters of the Dead Sea, that become almost an abstract undersea landscape. The exceptional physical qualities of this salt water make this an unusual study: depth, weightlessness floating, where the presence of salt eradicates any possible life form. Edith Dekyndt films the emptiness and the supposed absence in this sea, in which we can, however, notice an immense richness of movements and colors due to light variations of light. 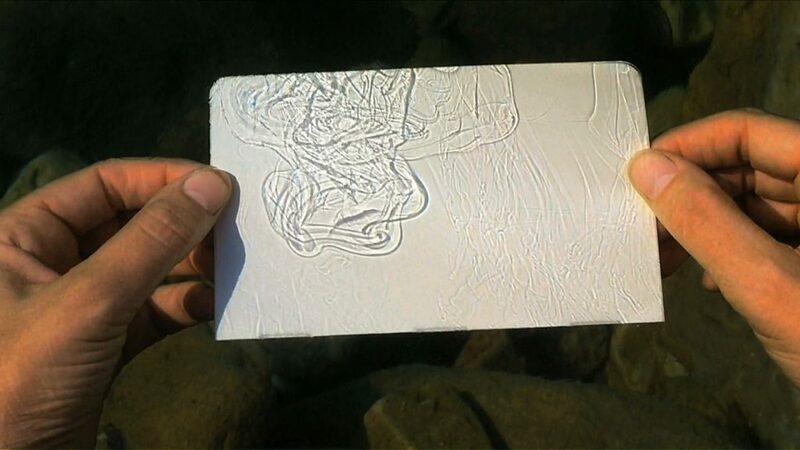 In Dead Sea Drawings, the artist films the surface of the sea, under which she places a white sheet of paper. The shadows of the minerals present at the surface of the water create a random drawing, like an infinite variation of designs. She reminds the spectators that this sea and its coast have been witness to thousands of years of history, different religions and are still marked today by three distinct political entities. This work is part of a project called Lot’s wife (La Femme de Loth), which refers to a passage in the Book of Genesis in which the patriarch, Lot, and his family run away from Sodom and Gomorrah during the destruction of the two cities. Disobeying the Angel’s command not to look back, Lot’s wife turns into a salt statue. For this project the artist has made a series of drawings where the salt creates hollows in the paper, distorts it, damages it and in doing so, creates forms and designs.